THE BREEZE CEDAR PERGOLA (8 Post) – The Ambiance of Classic Rome! A magical roman experience… sit back and enjoy a nice glass of wine under the beautiful shade. The tremendous Breeze Pergola (8 Post) will take your mind on a journey through the great classic Rome. — With a generous 31′ length and breathtaking craftsmanship, it is guaranteed to take your fabulous hospitality to a higher level! 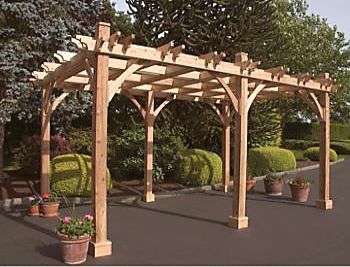 The Breeze Pergola (8 Post) has been crafted by talented craftsmen using a premium Western Red Cedar – a well known lumber for its beauty, durability, and strength. And not only does everything come pre-cut, but also pre-drilled and notched to make the assembly incredibly easy for you! The Breeze Pergola (8 Post) comes with a colossal Cedar pergola kit – 8 posts and framework of either 8′ x 31′, 10′ x 31′ or 12′ x 31′, installation hardware and step-by-step illustrated instructions. Have the atmosphere of Rome in your own backyard! …Only unlike Rome, it takes less than a day to assemble! Available Dimensions: 8′ x 31′, 10′ x 31′ or 12′ x 31′!